When it comes to the safety and security situation in the country, Peru unfortunately has an extremely bad reputation; and especially travelers spending their well-earned vacation in Peru and foreigners moving to the country are often concerned. The experienced reality in the year 2017 however is quite different. While Peru surely isn’t the safest and most peaceful country on the planet, it as well isn’t the worst. And exactly this is the conclusion reached by the Global Peace Index 2016 that just recently was published by the Institute for Economics and Peace (IEP). The Global Peace Index ranks 163 independent states and territories according to their level of peacefulness covering 99.7% of the world’s population. Using 23 indicators, the index takes 3 main areas into consideration: safety and security in society, the extent of domestic and international conflict, and the degree of militarization. According to the study, overall the world became a slightly more dangerous place in 2016. 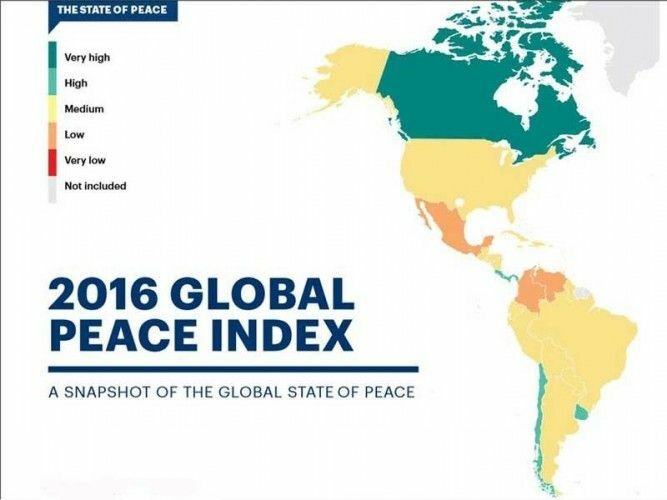 In 79 countries the situation deteriorated compared to 2015 while in 81 it improved; and Peru was one of the countries with a higher peacefulness than a year ago. While in general countries in Europe and Oceania as well as Canada, and Japan are the most peaceful, Peru after all could achieve a mid-table place and was ranked 85th. In the South America ranking Peru is on 7th place after Chile (globally position 27), Uruguay (globally position 35), Argentina (globally position 67), Ecuador (globally position 76), Paraguay (globally position 80) and Bolivia (globally position 81) and before Guyana (globally position 95), Brazil (globally position 105), Venezuela (globally position 143) and Colombia (globally position 147). For more detailed information and analysis read the full Global Peace Index attached below. And those still being a little bit concerned about the security situation and their safety in Peru, have a look at our extensive Security Series "Travel Tips and Safety Advice for Peru” which covers every conceivable aspect regarding safety and security including useful travel tips.